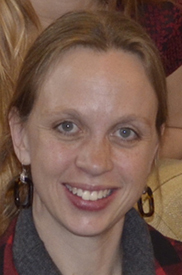 Maria de Boef Miara was recently promoted to Assistant Professor of Biology. Since joining Brandeis five years ago as an adjunct instructor, she has particularly enjoyed teaching the Human Physiology course and is excited to be developing an accompanying lab course for Fall 2018. This course will give students the opportunity to learn about human physiology experientially, using the most up-to-date technology. It will also allow students interested in health careers an opportunity to complete an important prerequisite. By studying how their physiology changes under a variety of conditions, students will get a hands-on feel for the subject. For instance, they will observe how cardiovascular and respiratory systems change when they exercise. They will witness how muscle activation differs between different body positions, such as the difference between winning and losing an arm wrestling match. They will determine whether they are able to respond more quickly to visual or auditory stimuli. And, by the end of the semester, they will be able to design and conduct their own experiments to study a physiological phenomena of their choosing. Maria is excited for the opportunity to work more closely with her students in these smaller lab sections. She feels very fortunate to be able to work with the motivated, curious, and collaborative undergraduates found at Brandeis and she looks forward to giving them the space and support to explore their interests in human physiology. 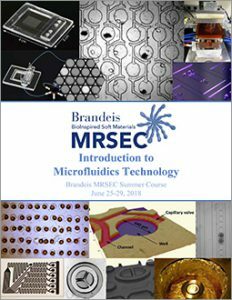 The Brandeis Materials Research Science and Engineering Center (MRSEC) has announced that the annual Introduction to Microfluidics Technology summer course will take place at Brandeis University from June 25th-29th 2018. This is a week-long course that runs from 9:00 am to 5:00 pm each day. Graduate students, postdocs, faculty, and industrial scientists and engineers are invited to apply. Registration closes March 31, 2018. The hands-on course was developed for scientists and engineers interested in utilizing microfluidic technology in the physical and life sciences. Students enrolled will have the opportunity to learn different microfluidic fabrication techniques and create custom-made microfluidics devices relevant to their research or work. Course details and application instructions can be found on the MRSEC site. Brandeis’ MRSEC is offering two one-week courses in June 2017. “Introduction to Microfluidics Technology” and “Biomaterials: Kinesin Production for Beginners” are both hands-on laboratory courses with no prerequisites. This course is intended for graduate students, postdocs, faculty, and industrial scientists/engineers interested in laboratory-scale expression and purification of kinesins, the biomolecular motors that power Brandeis MRSEC’s highly regarded active liquid crystals. The course is suitable for non-biologists who do not have access to any major specialized equipment at their home institution, since the goal of the course is to make protein production accessible to a wider variety of labs. Register early (by March 1) for a $50 discount. Regular registration for both courses closes March 31, 2017. Both courses are sponsored by the National Science Foundation’s Bioinspired Soft Materials Research Science and Engineering Center (MRSEC) at Brandeis. We would like to call attention to a new class offered this winter/spring 2014 quarter, being taught jointly by Prof. Daniel Ruberman in Mathematics and Prof. Albion Lawrence in Physics. This is being listed jointly as Physics 202a (Quantum Field Theory) and Math 221b (Topics in Topology). It is being team-taught under the auspices of the Brandeis Geometry and Dynamics IGERT program. This course aims to introduce basic notions of fiber bundles and connections on them, and their application to basic physical examples in classical and quantum mechanics: especially the mechanics of deformable bodies, and Berry’s phase. The target audience is mathematics and physics students, and mathematically inclined students in physical chemistry, neuroscience, computer science, and economics. The essential principles here find applications to chemical and neural oscillators and control theory; there have even been suggestions that it is a useful language for describing currency trading. The mathematics covered here typically appears in advanced courses on quantum and statistical field theory. However, it has much broader applicability, and the instructors felt that studying more elementary physics examples better highlighted the essential mathematics and lead to a broader perspective that would better prepare students to find new and creative uses for the mathematics. Furthermore, they allow us to teach a broader audience, as the essential physics background is straightforward and can be explained without the student needing two years of graduate-level physics courses. This course is essentially a graduate course, but it is certainly appropriate for senior undergraduates with a solid mathematical background (math and physics majors especially). The modern mathematical language of manifolds and vector bundles will be introduced and used throughout, but with reference to physical and geometric notions. This will provide physics students with an appropriate vocabulary for further study, while mathematics students can try to grasp the intuition behind the formalism. Note that the course satisfies one of the IGERT course requirements; however, we strongly encourage non-IGERT students to enroll. Course registration for Spring 2013 has opened. I asked faculty to share details about new (and old) exciting and different courses being offered this spring. We are offering our CHEM 146 “Advanced NMR spectroscopy” course again in the spring, appropriate for grads and advanced undergrads in physics, chem, biochem, biophysics. Pre-reqs are Physics 10 or equivalent, Math 10 or equivalent. There is a laboratory component this year (using the 800), intro to theory of NMR and practical applications. The text for the course is our book [ed. 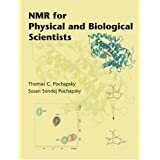 : NMR for Physical and Biological Scientists (Thomas Pochapsky and Susan Sondej Pochapsky, authors)], now available as an e-book.